Help Operation Once in a Lifetime make a dream come true for a military family who just received news that every parent fears. My son Camden is a 6 year old boy who loves his 2 brothers, sister, mom, dad and all his family very much. He is a typical boy that loves playing video games. He is outgoing, talkative and very sweet! I am an Army veteran and his father is still actively serving in the U.S. Army. We are very proud to be a military family! Camden experienced weakness in his legs and problems climbing stairs not long ago and we knew something wasn’t right. After a few trips to his pediatrician and a visit with a specialist, our worst fear was confirmed. He was diagnosed with Duchenne Muscular Dystrophy. This is so devastating to Camden. DMD is a debilitating disorder that causes progressive loss of muscular function and weakness that begins in the skeletal muscles. There is currently no cure or treatments for the symptoms of the DMD, which can include paralysis, respiratory issues and heart failure. It is life threatening condition. Camden has a wish and that wish is to have a family vacation on the beach, is there anyway Operation Once in a Lifetime can help make this dream come true? 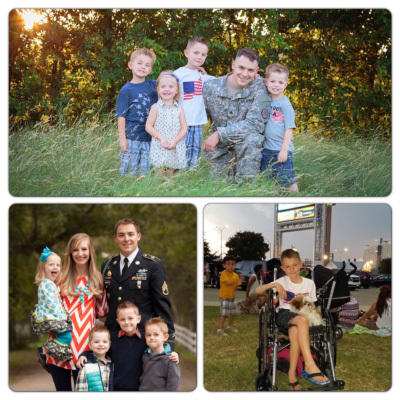 If you would like to support the McAlpine family you can DONATE or contact us at staff@operationonceinalifetime.com.